Four decades is not only a long length of time but also reveals a major position of ones life. Tony Ranasinghe, the famed actors involvement in the world of arts, covers that period. During that time he excelled himself in his portray of different characters always winning the appreciation and respect of his fans. The fatherly figure in todays performing arts Tony Ranasinghe, has contributed immeasurably his share for the growth and development of the film industry. It was in 1962 that Tony got a break in both stage as well as films. Sugathapala Silvas Bordingkarayo and a small role in Lester James Peiriss Gamperaliya opened the doors for a long journey in the world of art for him. From there onwards there was no falling back for Tony who was in great demand by producers and directors who knew the cash value of his full effect of his acting. "It is not that all the films I acted, can be looked back with relish, but as a professional actor I cannot be choosy about the roles performs, says Tony". My opportunities were a mix bag with good as well as medium, I have always performed well and have no regrets about my contributions. "There should be both, art and commercial films produced to feel the difference between the two. One must involve in both types." "A film is produced to be seen by an audience. A good film, in my estimate, is a cinematically produced one", says Tony. He attributed the advent of television as the main reason for the downturn of the film industry which, prior to its invasion, was the only medium of entertainment for people of all classes. "Sri Lanka, being a small country, could not withstand the pressure of the influence of television. America with its well developed film industry was not threatened by television. and the rapidly increasing cost of film production. Commenting on actor turned politicians, he said non of them has held portfolios that could have helped the film industry. The government, faced with serious political and economic issues, cannot pay much attention to a small industry of this nature. "All performing artistes should make a collective effort to up strengthen the film industry without waiting and hoping for the government to do the needful. You have to work for your daily bread, unless you have other avenues to support", says Tony. Tony is not a mere artiste or actor. His scripts, which turn out to be successful life stories, have won admiration of a wide cross section of society. Be it on the silver screen or in the mini screen, teledrama or for that matter an advertisement, he attracts the attention of the audience and thereafter he becomes a part of them. Hailing from stage and films to the mini screen, the journey was not smooth sailing. It involved determination, courage and commitment. The future of the film industry is very bleak and murky unless something quite unexpected happens. The dearth of film producers, lack of finances and other facilities acts as barriers required to be overcome. With a reputed businessman as the new chairman of the National Film Corporation, we see a silver lining in the dark clouds. A man of his calibre could revive the industry, Tony says hopefully. Best things are hard to come by. 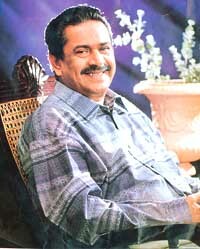 Our film industry is blessed with many veteran artises and a pool of talents of the calibre of Tony Ranasinghe.